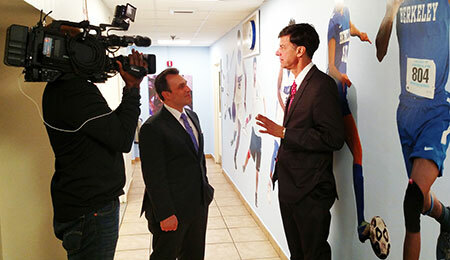 Photo Caption A: Steve Overmyer of CBS 2 News New York (left) interviews Chris Christiansen, Head Coach, Berkeley College Men’s Basketball team, about the Berkeley Knights’ record-breaking season. 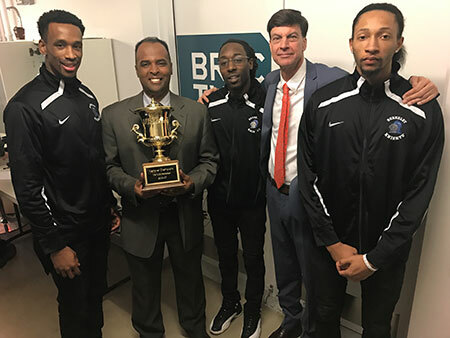 The Berkeley College Men’s Basketball team has been garnering attention within the sports world after winning its third consecutive United States Collegiate Athletic Association (USCAA) Division II Men’s Basketball National Championship and ending its season with a 53-game winning streak. The record-breaking season has led to the team’s players and Chris Christiansen, Head Coach, appearing on a variety of television and radio programs. Click here to watch Coach Christiansen and the Berkeley Knights players’ appearance on CBS 2 News New York. Click here to watch Coach Christiansen and the Berkeley Knights players’ appearance on BRIC TV. Photo Caption B: Head Coach Chris Christiansen (second from right) and players from the Berkeley College Men’s Basketball team show BRIC TV’s Micheal Bellamy, senior sports producer (second from left), the United States Collegiate Athletic Association Division II Men’s Basketball National Championship trophy the team won for the third consecutive year. All-star Berkeley Knights players (left to right) include Johnnie Green, Massiah Merritt, and Stephon Jennings. 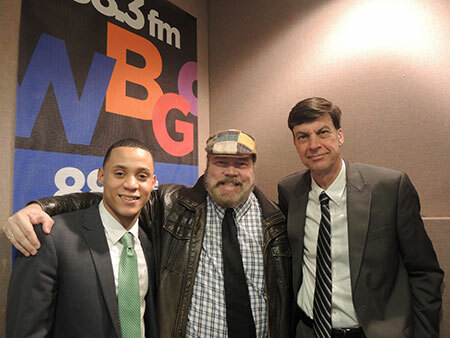 Earlier this month, Coach Christiansen and Mr. Mejia appeared on Newark Public Radio station WBGO 88.3’s “SportsJam.” Speaking with Doug Doyle, host and WBGO News Director, the two shared their own personal journeys that led them to Berkeley College. “It’s more like a family … the atmosphere in Berkeley and the basketball team,” said Mr. Mejia. Portions of the interview also appeared on-air during the station’s weekly news magazine program, WBGO Journal. Photo Caption C: Student-athlete Jeffrey Mejia (left) and Chris Christiansen, Head Coach (right), of the Berkeley College Men’s Basketball team talk with Doug Doyle, WBGO News Director and host of the “SportsJam” podcast, about the Berkeley Knights’ record-breaking season. The Berkeley Knights became the first team to win three straight USCAA crowns, outlasting the No. 6-seeded Nittany Lions of Penn State York by a score of 80-76 in the title game of the championship contest, held on March 5, 2017, at the campus of Penn State Fayette. The team ended its unblemished 2016-2017 season at 29-0, extending its program winning streak to 53 consecutive games. To watch Head Coach Chris Christiansen, Jeffrey Mejia, and Dondre Simmons’ appearance on CBS 2 News New York, click here. To watch Head Coach Chris Christiansen, Stephon Jennings, Massiah Merritt, and Johnnie Green’s appearance on BRIC TV, click here. To hear Head Coach Chris Christiansen and Stephon Jennings’ appearance on 77 WABC Radio’s “Sports Desk with Mike Gunzelman,” click here. To hear Head Coach Chris Christiansen and Jeffrey Mejia’s appearance on WBGO 88.3’s “SportsJam,” click here.